You are here: Home / motivation / Biceps Workout | It’s the Negative! Biceps Workout: CLICK Here To Get Your FREE 12 “Minute Ultimate Stubborn Fat Loss Sequence” Workout That You Can Use Today to “Target” that Stubborn, Hard-To-Lose Belly Fat WITHOUT Losing ANY Muscle. How do you get powerful, sculpted biceps? Well, what is your biceps workout like? There is plenty of research backing up the concept that to get those enviable biceps you must concentrate on the negatives (or the eccentric). This video blog by Shaun Hadsall will show you just how to do that. If you think it’s all about cardio and eating well, you will never get that sculpted look. You’ll just shrink in size by dropping weight. So if you have an apple-shape body you’ll just be a smaller apple. The answer is that you must weight train and do it properly. You need to use the negative portion of the exercise to stimulate twice as as much muscle fibers which will indirectly lead to more fat loss and more belly-fat burn. It’s not about “lifting weights.” It’s about “lifting and lowering” weights. If you don’t know how to lower the weights you will not get that sculpted look…ever. In the video, Shaun demonstrates using the biceps curl (or biceps brachii) to get this point across. In the biceps curl, your elbows must be close to the body. The elbow is the point of rotation (the fulcrum). Don’t allow the elbows to move forward. As you are coming up with the weight (or the concentric) you count for a count of “ONE” while you EXHALE. Then when you lower the weight (eccentric) you INHALE for a count of 4. Lower weight, ==> inhale 1-2-3-4. 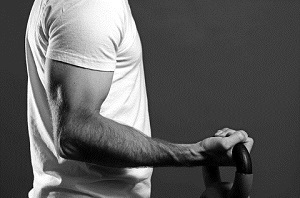 This biceps workout stimulates more calorie-burning and after-burn effects. Make sure you’re doing the proper rep ranges and having the proper rest periods to melt off that belly fat. For more great videos such as this one: Biceps Workout, or other videos on Fat Loss, Motivation and Tips, be sure to check out our YouTube Channel and become a subscriber!